Mix a handful of thunderous beats and a dash of dirty Souf swagger in a bucket filled with Southern-fried, greasy guitar. Then roast ingredients all day in the sweltering Georgia heat, pepper with good-time lyrics, and enjoy the spicy southern rock jambalaya of FAMILY FORCE 5. Since 2005, the genre-obliterating Atlanta quintet has been setting audiences’ feet alight with their incendiary dance-rock anthems, turning that dance floor into hot coals, refusing to let fans keep their kicks still. Part party-bangers, part grimy rockers, Family Force 5’s booty-quaking beats and face-melting synths have earned them a devout following culled from their seemingly ceaseless touring and chart-topping albums, the group’s previous album 08’s Dance or Die debuted on the Billboard Top 200 chart at #30 and at #8 on the Modern Rock with 13,000 copies sold in the first week. 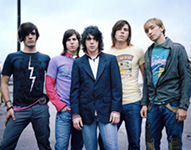 Their frenetic 2006 debut Business Up Front, Party in the Back was released on Maverick records, but when the major label politics became burdensome, Family Force 5 forged their own path, pushing their release to sell over 350,000 digital singles and well over 150,000 albums. It’s the DIY-style that has made this musical family (made up of the brothers Jacob, Josh, and Solomon Olds, and brothers-from-other-mothers, Nathan Currin and Derek Mount) into a self-made juggernaut that steam rollered audiences with their upbeat party anthems and raucous stage antics. Their 2008 follow-up Dance or Die pushed the band further into electro-groove territory, with Solomon’s passionate vocals leading the synth powered cavalcade. Now after three years of touring the universe and electrifying crowds at big festivals like Sonisphere and the Vans Warped Tour, the band is back with their new release, III. “We wanted this to be our Thriller album. We just didn’t land the guest appearances by Paul McCartney or Eddie Van Halen,” guitarist Derek Mount jokes about the much-anticipated follow-up to Dance or Die. “We wrote this record every where while we were on tour,” says Solomon. “It was written on my laptop and recorded in studios around the world. We wrote nearly 70 songs in the back of the bus, on airplanes, in barbecue joints, and in a cabin in the north Georgia mountains.” III takes Family Force 5 back to their rock roots, and those early days when the Olds brothers would perform in a backyard shed at their parents’ Marietta, Georgia, home. Music wasn’t a choice for these brothers; it was in their blood. “We were destined for music,” Solomon says. “We knew we had to do it.” Their father Jerome Olds was a well-regarded singer and their mother was a music teacher. While they were just adolescents, they founded a band, honing their musical chops on stages across the country, until the spirit of rock compelled them to pick up guitars in the 2000’s. On the new album’s return-to-rock sound, the band resurrects the heavy guitars and bombastic beats of their debut. Opening track “Can You Feel It” explodes with searing guitars and Solomon’s distorted voice slices through the boom-bap of tumultuous drums. “Our goal was to make jock jams for the future,” Derek says about the album opener. “At the time, we were listening to a lot of Sleigh Bells, and we wanted to create something mean and gritty that you could hear on Sports center. 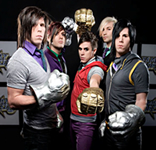 This track gets people hyped up, and it perfectly sets the tone for the rest of the album.” Unadulterated energy ties the band’s unstoppable genre-hopping as FAMILY FORCE 5 explores low slung bass booms and harmonica howls on “Wobble” and the tongue-in-cheek “scenie baby” call-out pop song, “Tank Top.” These are songs for blaring at maximum volume, blasting from a sweaty club or a low-riding pick-up truck. “III sounds like rock and roll with barbecue sauce,” Derek laughs. Although they aren’t afraid to take a trip on the ironic side, the band tips their hats to authenticity and the places where they grew up. “We embraced the redneck part of where we are from,” Solomon says. “We tried to run away from it for so long, but there’s no denying: there’s some country boy in us.” On III, the band wanted to infuse a taste of reality too, exploring more than just the party scene that they had been espousing for their career. On “Paycheck,” the band addresses the challenges of living in a country suffering with economic collapse and seemingly incurable unemployment. 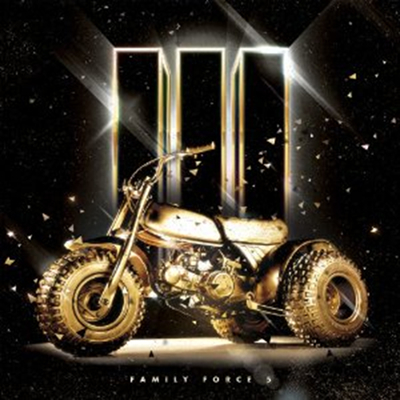 “I’m broke/broke as a joke/thinkin’ ‘bout movin’ back in with my folks,” Solomon sings on “Paycheck.” Along their tireless touring schedule, Family Force 5 heard the stories of their fans who were down on their luck, unemployed and struggling to survive. “A lot of America is pretty poor right now,” Solomon explains. “We kept hearing our fans say that they were living paycheck to paycheck. So we wanted to write a song about that, with a positive message that turns it around.” On the downbeat “Not Alone,” they dig a little deeper as Solomon sings about the anxiety and tribulations induced by leaving their families at home amidst their relentless tour schedule. The song’s desperate longing for restoration also drew inspiration from the severe illness of his brother and band mate Joshua, who nearly died from kidney failure during the band’s Christmas tour. “We were on tour, and I was in emergency room with him, so there was nobody else out there when I found out that he was really sick,” Solomon remembers. “I felt so alone at that moment in time and I wanted to talk about that in this song. It’s one of the most serious songs we’ve written. We still have some crazy, stupid-fun songs, but now we can get a little deeper. 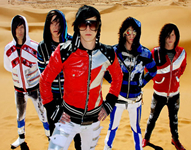 I feel like we’re growing up.”After a lifetime of making music, FAMILY FORCE 5 have unmistakably come into their own. They’ve forged together their disparate musical influences, their reckless attitude, and heartfelt authenticity into III. Now, with hardships behind them and the open road ahead, the band is on a mission to keep their fire spreading and their family growing.